Imagine you're riding throughout the night in less than perfect weather. You can see the rain streaming through the high beams and you're so focused on the road that you don't take the time to wipe the rain off of your visor. Your muscles are tense, your senses are on edge because you're not familiar with the particular road you're on. This is when perfect timing comes in and your headlight burns out. It's a really scary scenario, and one that I found myself in not too long after getting my first bike. Luckily, the low beam still worked. I slowed way down and took my time, but I was worried that any bump might cause it to burn out too, and I'd be stranded. The next day, I went out and bought a new bulb, and I was pleasantly surprised by these guys. 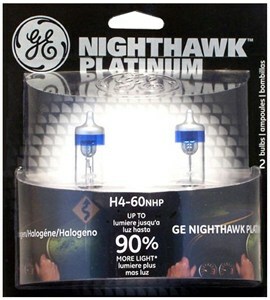 The NightHawk Platinum Replacement Bulb, from GE, actually does appear to give off 90% more light than a standard halogen. The light is pure white, too, and doesn't have that yellow tint that you see in a lot of bikes on the road. They're so bright that people might flash their brights at you thinking you've got them on, which I love because then I flash my brights and really blind them. I don't feel bad about it either; because I've only got one headlight, it ought to be as bright as it can. These bulbs are available in many wattage settings, so make sure you find the replacement bulb compatible with your motorcycle.